The following edited International Action Center press statement was released March 1. 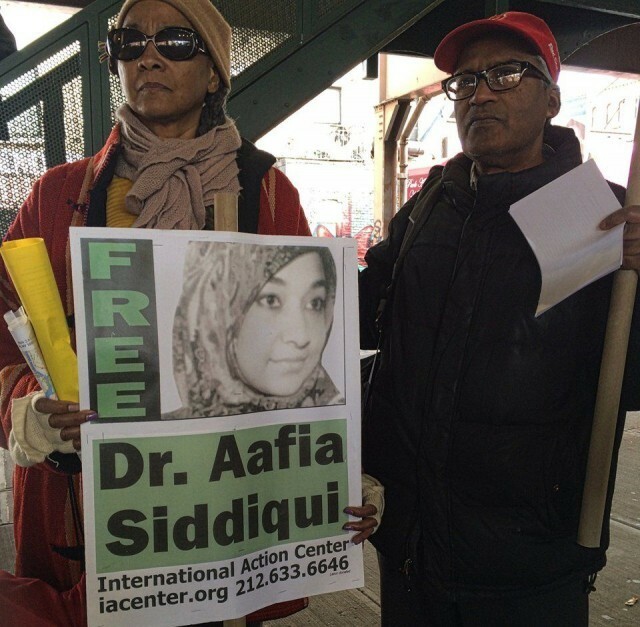 March 2016 will mark 13 years that Dr. Aafia Siddiqui has been a political prisoner. Boston – March 8, 4 p.m.
New York City – March 11, 4 p.m.
Washington, D.C. – March 19, 12 p.m.
Fort Worth, Texas – March 30, 6 p.m.
Mauri Saalakhan of the Aafia Movement: “Four demonstrations during March, Women’s History Month, are calling for an independent medical team, including Dr. Fowzia Siddiqui, a medical doctor who is Aafia’s sister, to be permitted to visit Aafia to evaluate her health. The demonstrations will also demand the repatriation of Dr. Siddiqui to her home in Pakistan. “Aafia Siddiqui’s life is on the line. She has not had a prison visit with any family member or her lawyer in more than a year. Aafia is a victim of the U.S. torture program in Afghanistan and of continuing prison abuse in federal prison in Fort Worth. Sara Flounders of International Action Center explained: “I attended Aafia Siddiqui’s trial in federal court here in New York City. “During her trial, Aafia called out many times her innocence and that she had been tortured and horribly abused. She pleaded for an end to the violent strip searches that preceded every day in court. She was continuously ruled disruptive and out of order. “During this time thousands of Muslims ‘disappeared’ into U.S. secret prisons and into Guantánamo Prison as part of the U.S. war on terror. Well-documented U.S. tactics included targeted assassinations, drone attacks, secret rendition, disappearances and routine torture. “This horrendous violation of human rights must end. The secret prisons must end. Guantánamo Prison must be closed and Aafia Siddiqui must be returned to Pakistan. Shahid Comrade of the Pakistan USA Freedom Forum explained that “an enormous movement of mass support for Aafia’s repatriation to Pakistan has swept Pakistan. Aafia has become a symbol of the thousands of disappeared prisoners. Millions of Pakistanis and all political parties from left to right, religious to secular, have demanded her return to Pakistan. Support for the rally includes the International Action Center; the Islamic Leadership Council of New York; the Lynne Stewart Defense Committee; Jericho-National; Masjid At-Taqwa; the Mosque of Islamic Brotherhood; the National Coalition to Protect Civil Freedoms; the New Abolitionist Movement; NY4Palestine; the Pakistan USA Freedom Forum; Project Salam; the Samidoun Palestinian Prisoner Solidarity Network; the South Asian Fund for Education, Scholarship and Training; and the United National Antiwar Coalition.